Buying a home in America is the most affordable it’s been since 1980, according to new data from Trulia. Mortgage rates have dropped, which increases long-term affordability for homeowners. 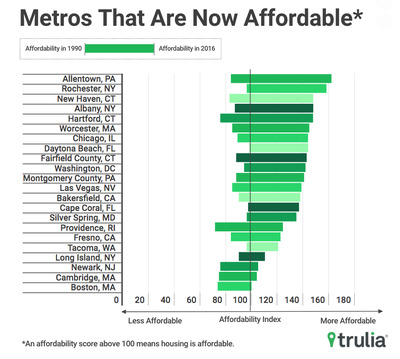 Only three of the 100 largest metros – Denver, Miami, and Portland, Oregon – have become less affordable since 1990. Rising mortgage rates and the new tax law, which reduced the mortgage-interest deduction cap, could threaten affordability. The US housing market is favourable for sellers and tough for buyers right now. Prices are steep thanks to strong demand and low supply, particularly for starter homes. But all things considered, buying a home is more affordable for millennials now than it was for their parents, according to new data from Trulia’s housing-economics research team. “Thanks to low mortgage rates, buying a home is actually more affordable now than in the past 40 years,” Alexandra Lee, a housing data analyst at Trulia, told Business Insider. Mortgage interest rates hit 16.6% in 1981 in response to massive inflation in the US. In 2016, interest rates fell to about 3.5%, and they’re about 4.5% right now. But if interest rates continue rising as expected, homebuying affordability could soon be threatened. Because of the Republican tax bill that President Donald Trump signed into law in December, new homeowners who deduct mortgage interest are limited to deducting the interest they pay on $US750,000 worth of debt, down from $US1 million. The mortgage-interest deduction has been a huge incentive to homeownership, but the new limits could deter first-timers. Millennials are increasingly renting longer and are able to save up a bigger pot of money for a larger down payment, Zillow’s CEO, Spencer Rascoff, said on an episode of Business Insider’s podcast “Success! How I Did It.” Ultimately, he said, millennials are skipping starter homes and going straight to the $US1 million range. Mortgage interest rates are a crucial variable for homebuyers. For a fixed-rate mortgage, the interest rate remains the same for the life of the loan. When interest rates are low at the time of purchase, monthly mortgage payments remain low. This increases long-term affordability for the homeowner, regardless of home price or interest-rate swings. In its latest report, Trulia found the “maximum affordable price” for the median-earning household in 100 metros every year since 1980, assuming a 20% down payment and a 30-year fixed mortgage at the annual average interest rate. The calculation included the cost of property taxes and insurance. 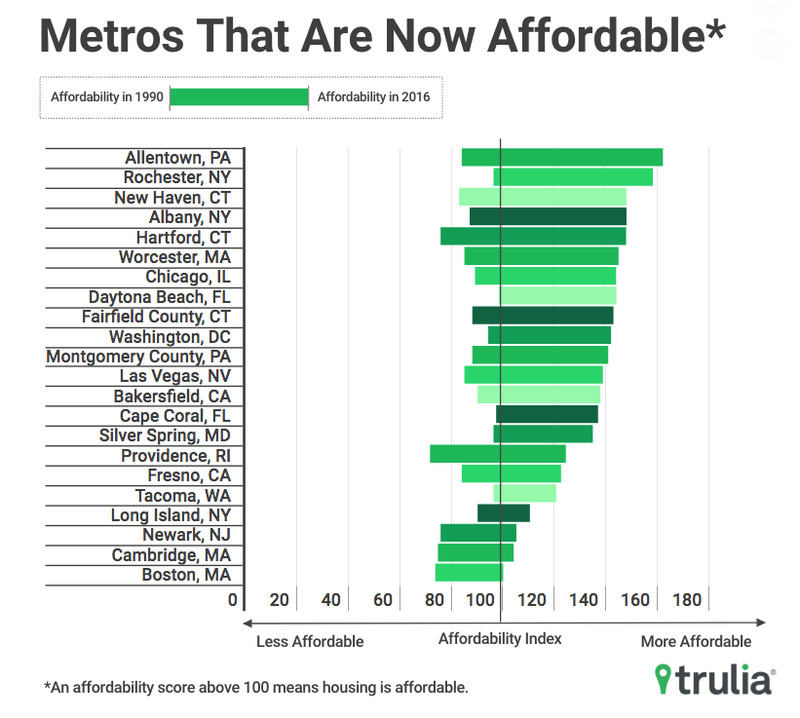 An affordability score for each metro was calculated by dividing the maximum affordable price by actual home prices, and multiplying by 100. Anything above 100 is considered affordable. Trulia found that the typical household in 1980 could afford only about three-fourths of the median home price, compared with the median household in 2016, which could afford a home 1 1/2 times the median home price. Twenty-two US metros crossed the threshold from unaffordable to affordable over the past four decades, according to the data. The markets that are too expensive for the average buyer now, including San Francisco, Seattle, and San Jose, California, were always too expensive. “Of the largest 100 US metros, only Miami flipped from being affordable in 1990 to being unaffordable in 2016,” Lee said. Trulia ultimately found that Americans’ homebuying power has strengthened in the past 40 years. Take Salt Lake City, for example. From 1990 to 2016, home prices increased 53%, but the affordability index jumped to 131 from 122. That is because interest rates dropped to 3.4% from 10% during that time. Homeownership in Salt Lake City became even more affordable over the 26-year period – and the case appears the same for many of the largest US metros. Only the Denver, Miami, and Portland, Oregon, metro areas dropped in affordability during that time, Lee said. By the end of 2017, a monthly mortgage payment on the median home in the US required just 15.7% of the typical household income, according to a report by Trulia’s parent company Zillow. Back in the late 1980s and 1990s, a mortgage payment took up 21% of the typical American’s income. Still, this doesn’t make buying a home any easier, especially for first-time buyers, Lee said. “Starter homes have become increasingly scarce and priced higher each year,” she said. According to the National Association of Realtors, millennials represent the largest share of homebuyers at 36% – 65% of whom are becoming homeowners for the first time. “To be a competitive buyer in today’s market, we recommend working with an agent that knows the market, getting pre-approved for a loan, and having your down payment ready,” Lee said.